1. 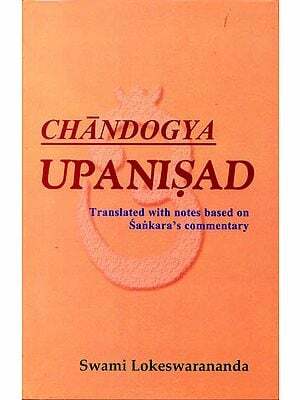 In the first place, the Upanisads are generally believed to be revealed; but what revelation means is that it the spontaneous utterance of certain God  intoxicated sages. 2. 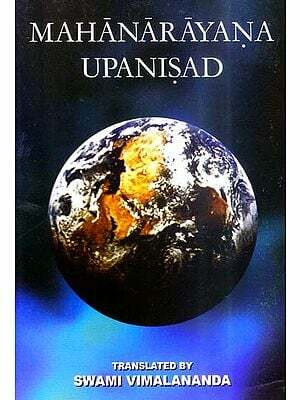 The Upanisads give us a view of Reality which is supported by a direct, first-hand, intuitive, mystical experience which no science can impeach, which is the end of all philosophies, and which is the innermost truth of all religions. 3. They mark the transition from the Nature-gods to Self, from the hymnology to reflection, from henotheistic polytheism to monotheistic mysticism. 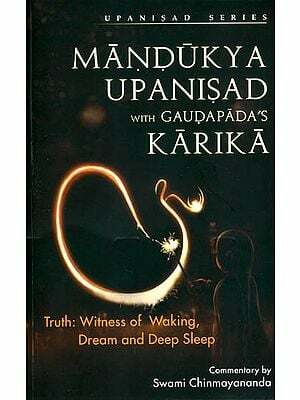 No longer is there any fear of the wrath of the personified gods; and so, they mark the transition from emotion and imagination of the Rgveda to thought and reason of the post-Vedic period. 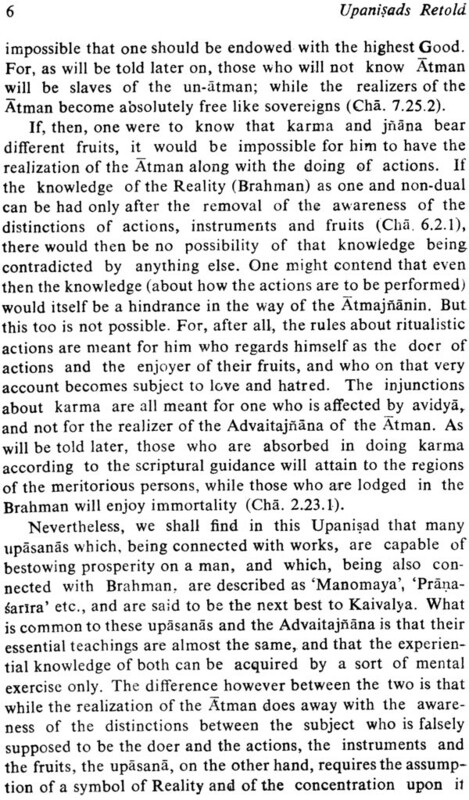 Hence, the guardian of natural and moral order does not come from without, but springs from the Atman who is the synthesis of what is both outside and inside, and who is varitably the ballast of nature. 4. 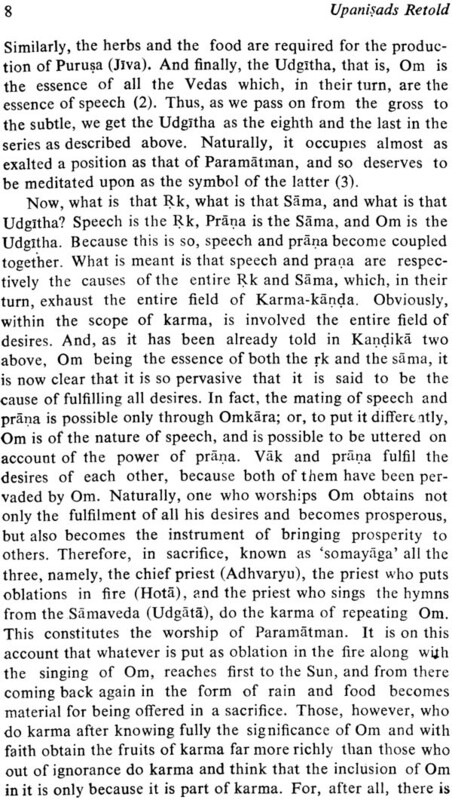 The Atman is the Ultimate category of existence to the Upanisadic seers. The Self must be regarded as the innermost existence, while the cosmological, physiological, and psychological elements are only external vestures which clothe the reality but which do not constitute it. 5. 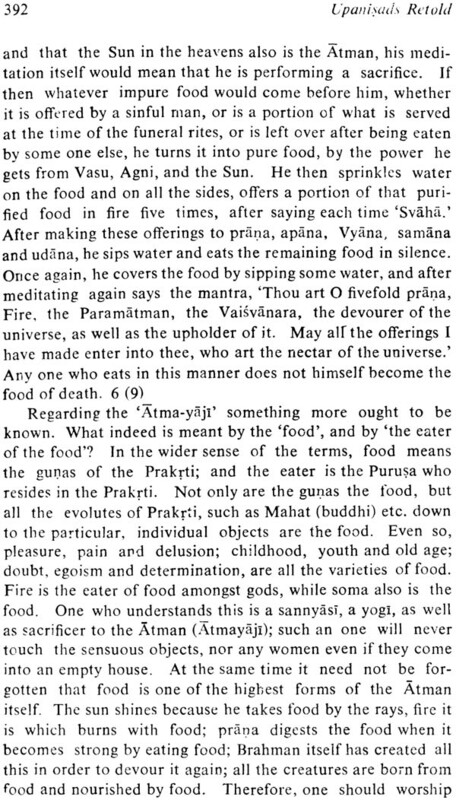 Hence, neither the bodily consciousness of the materialists, nor the "etheric double: of the Theosophists nor te sleeping consciousness which is really unconsciousness or ignorance, nor the twilight to the creative, dreaming state which is formed of imagination and memory nor again the so-called sheaths made of food, Prana, mind, and knowledge, are able to define the Self. It is the pure, wakeful, blissful consciousness of itself and is therefore identical with God and the Brahman. 6. God then comes to be recognized as the immanent, the innermost, and the supreme soul of all other souls and the beings of the world. Like sparks from fire or like the thread emanating from the body of the spider, all the beings emanate from Him: God is therefore the Creator, the sustainer and the controller from within (the Antaryamin) and the end of all. 7. As He is both immanent and transcendent, he must be realized in both these aspects. 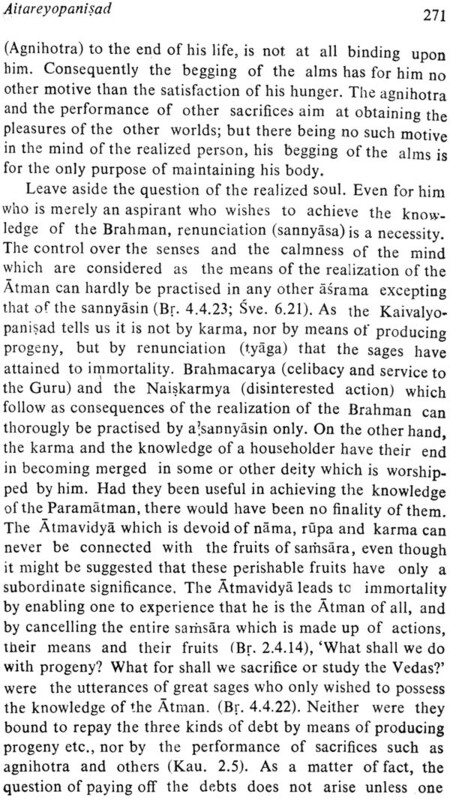 He must be realized not only as the in-dwelling Atman or the Antaryamin, but also as the transcendent Atman, as the Bahiryamin. 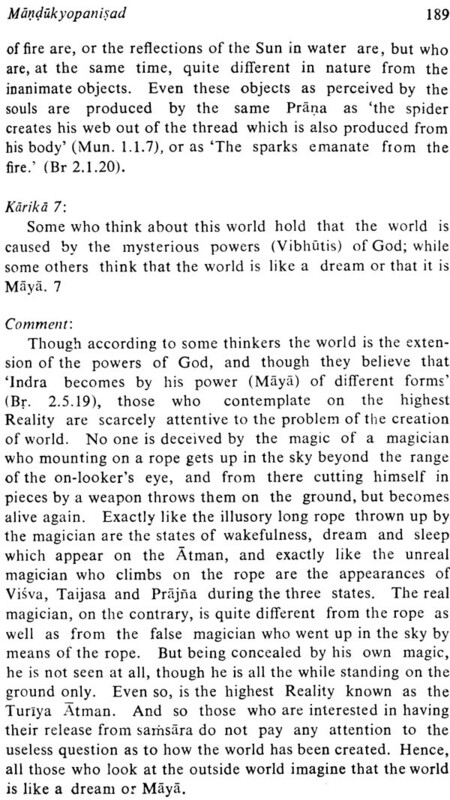 When both these aspects are seen as identical with each other, one gets the double assurance that what he has realized is neither an illusion nor a projection of the creative mind, neither an after-image of the perception of some idol, nor a short-lived object of the external world. 8. 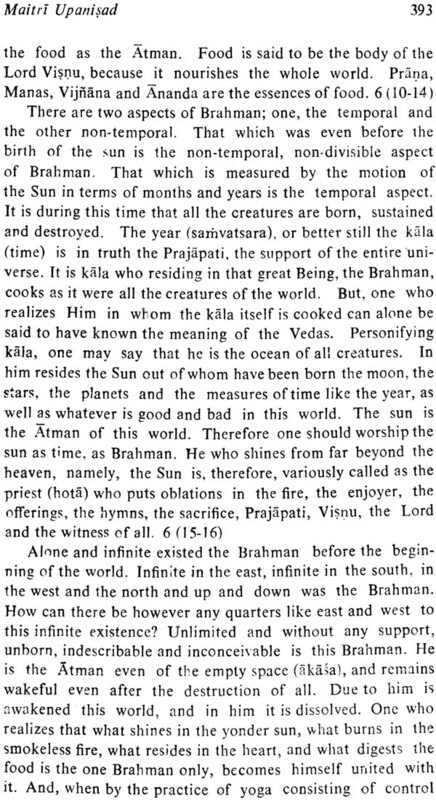 And when the same atman or God is seen as smaller than the smallest and larger than the largest, as being very near and far off at the same time, everywhere and at all time, he is called the Absolute or the Brahman as transcending even the limitations of space and time. 9. 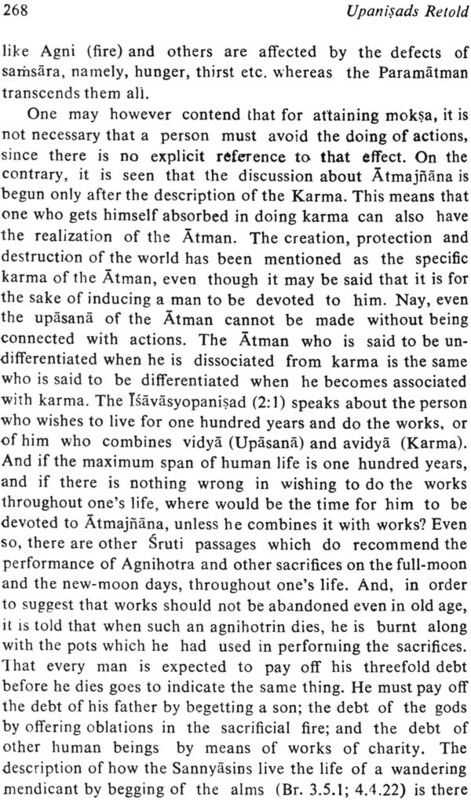 And when further the Atman is experienced as possessing various attributes, he is described as Saguna Brahman or God, but when he is experienced as not being limited by any one of the attributes, he becomes known as the Nirguna Brahman, or the Absolute and is then described in negative terms as "not this, not this". 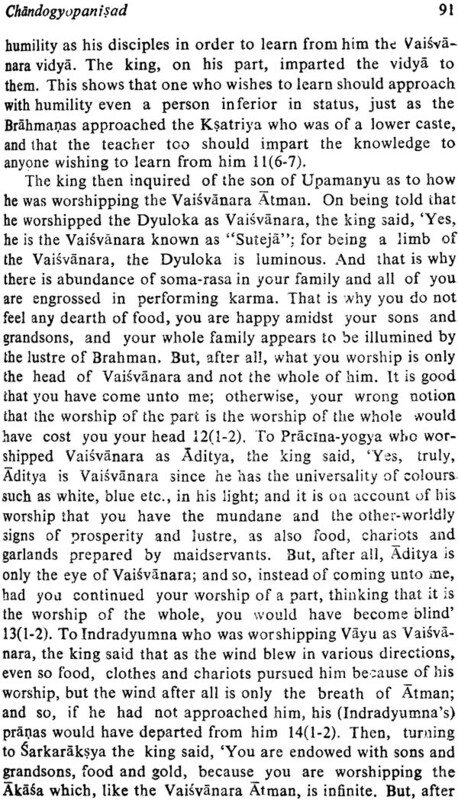 There are passages which describe the Brahman as possessing innumerable hands, feet, heads, eyes etc, and as being devoid of them all, and yet paradoxically, as the fastest of all, as seeing everything etc. in short, as being both static and dynamic. 10. The Atman is said to be unknowable as an expression of humility, but this does not mean that he is unknowable as an agnostic would say. 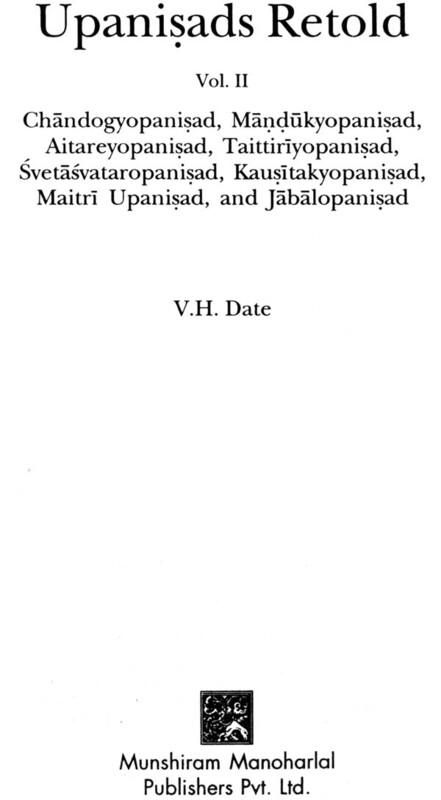 The Atman is not a logical necessity as in Kant; it is the object of realization for the Upanisadic seers. 11. 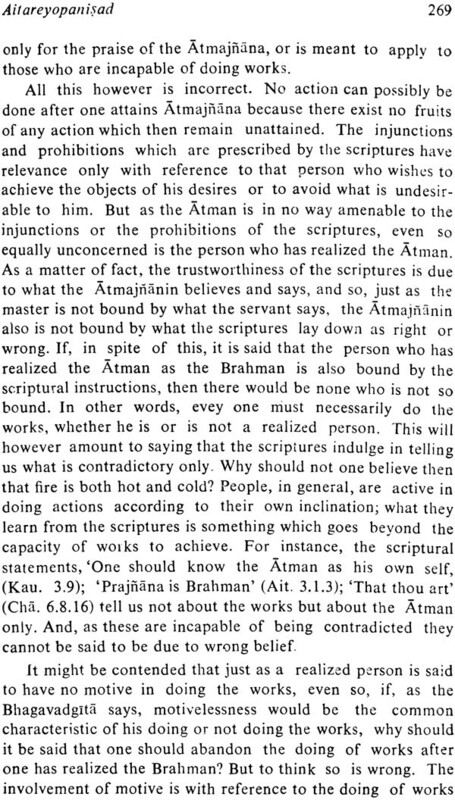 No doubt, if the Atman is the eternal subject, he cannot be the object of the empirical knowledge of any one. But this will not prevent the Atman to be the object of his own knowledge, just as one is not prevented from seeing one's own face in a mirror. The non-sensuous, eternal Atman is capable of beholding himself outside the body as if he is divided into two  one of the original and the other his reflection, just as the face in the mirror is the image of the human face before the mirror. The difference, however, is this. Whereas the face before the mirror is real, and that which appears inside the mirror is false, the Atman within the body and the Atman without the body are one and the same and is real both ways. 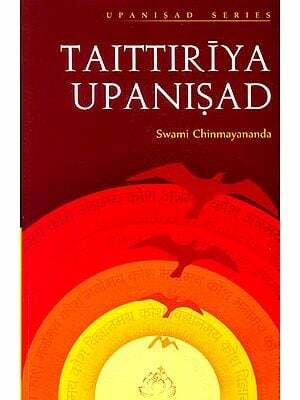 The Upanisad defines the Atman as the serene Being who emerging out of the body meets the light above and manifests in front of the mystic in his own immaculate form. There can be no two Atmans, one inner and the other outer, one Antaryamin, and the other Bahiryamin, one immanent and the other transcendent Atman. 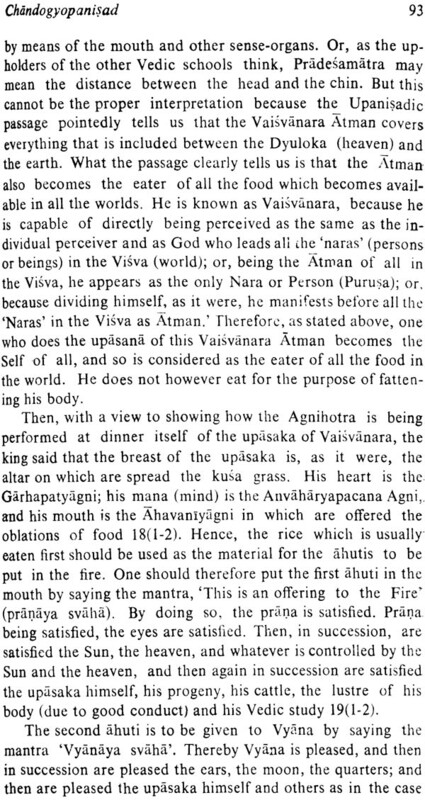 It is however the presence of the body that creates the feeling of the two aspects of the two aspects of the Atman. In fact, the Atman is one; and though in appearance he has the form of the body, it must be remembered that the immaculate form is the Reality and that the physical body is only a shadow or a short-lived image of that from. 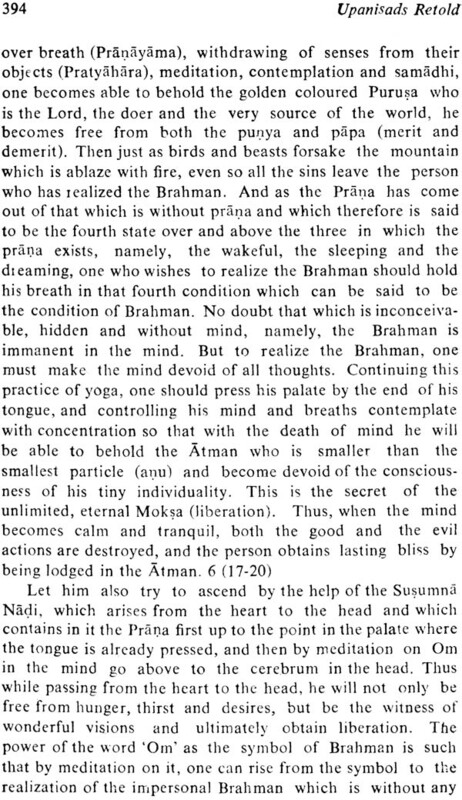 Hence the body is mortal, the Atman is immortal and eternal. 12. If then the 'I' is identical with God and the Absolute, then the, 'Thou' also, by parity of reasoning, is identical with God and the Absolute. This means that the 'I' and the 'Thou' or what is the same thing as the self and the not-self, or the individual soul and the Nature outside (including the souls of my fellow-beings) are identical with God and so with each other. Thus are the pluralistic and the dualistic aspects of the worldly existence dissolved in the one, pantheistic, mystical Reality  call it as the Atman or the Brahman. 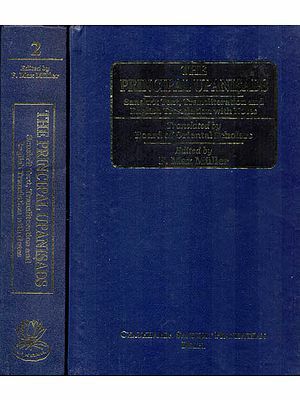 Theism is said to resolve the difference between Deism and Pantheism. Between a transcendent God and an immanent God. But this would be quite correct if the worshipper stands outside the two realms of Deism and Pantheism. 13. 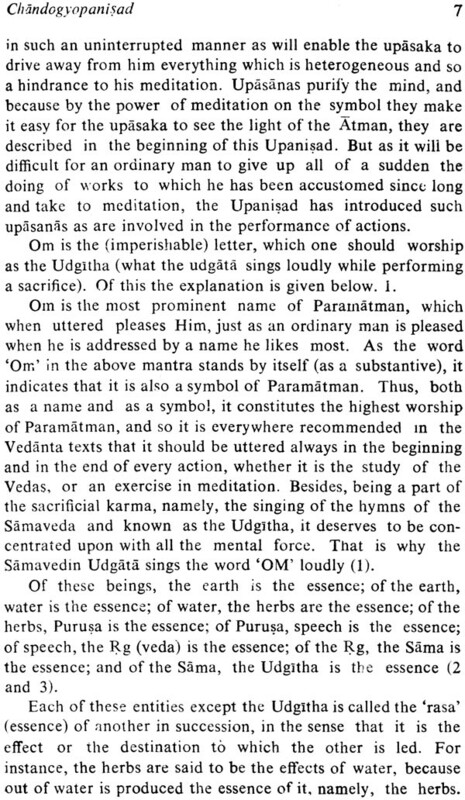 The Upanisads say with one voice that the realization of the Atman or the Brahman will not be possible unless someone who has already realized the Brahman shows us the correct way and the method of meditation and contemplation on the Name or symbol of God such as Om. One who has lost his way on account of his being kidnapped and made blindfolded will require the help and guidance of someone who is kind-hearted and who knows the way. The path of God-realization being the narrowest and the subtlest of all, one who wishes to travel on it will necessarily be in need of an expert guide. Without the grace of a spiritual teacher or the Guru one may wander and wander through the forest of Mays till the end of one's life, but one will never be out of it. 14. In the interest of the highest development of which man's consciousness is capable, it is as impossible to divide metaphysics from morality, as it is to divide morality from spiritual life. Just as intelligence without morality might turn out to be sophistry, even so spiritual life without morality will be hypocrisy; while morality without the support of intelligence and spiritual discipline might become hollow and imperfect. 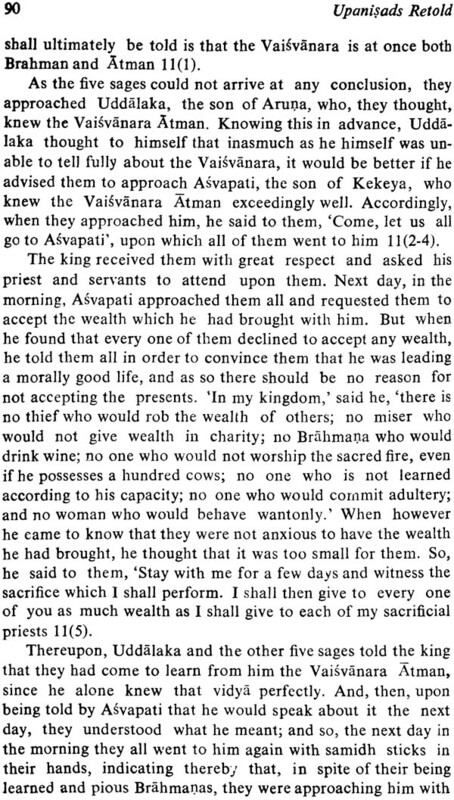 If the metaphysical theory of the blissful Brahmanic life is to be a practical reality, none can afford to be indifferent to morality. If desirelessness is the sign of the highest bliss which is achievable by being one with the Brahman, it cannot then be measured in terms of happiness or joy attending upon the pleasures of progeny, wealth, or fame. 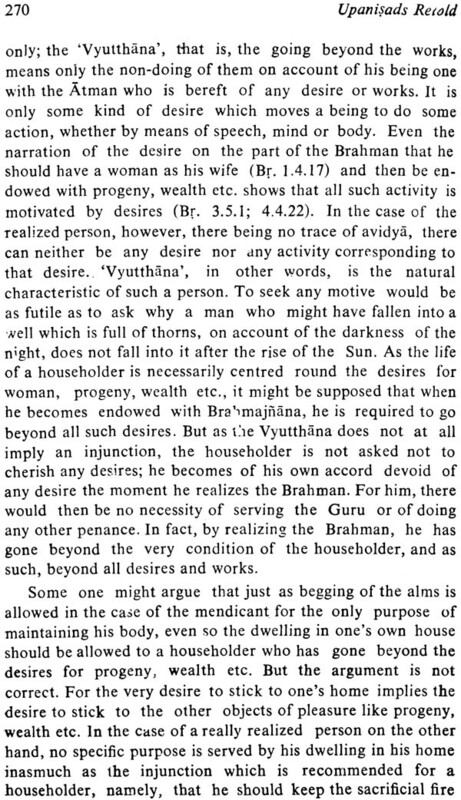 The realization of the Atman cannot be simply a theoretical ideal, an insipid and soul-less intellectual conviction; it means, as the great sag Yajnavalkya told his wife Maitreyi that " the Atman ought to be seen, ought to be heard, ought to be thought about ad ought to be meditated upon. 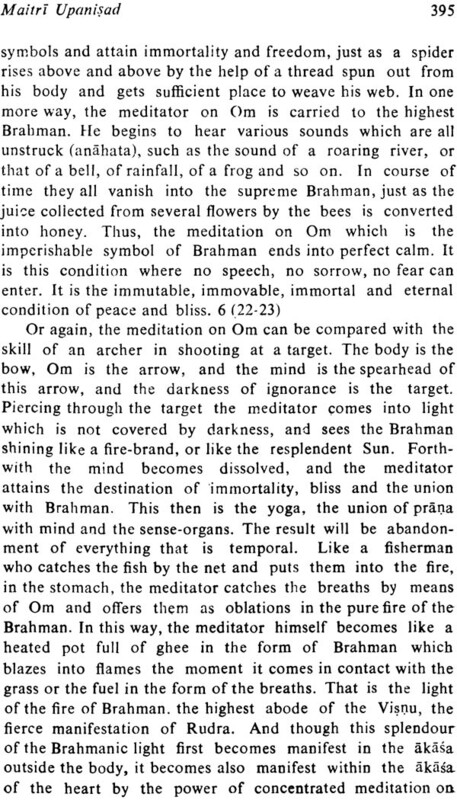 "But in order to be able to contemplate upon the Atman, mere intellectual understanding will not be enough. It must be backed up by a virtuous life. The transition fro theory to practice, from metaphysics to mysticism, must be made through a self-imposed moral life of altruistic virtues. 15. And finally, when contemplation upon the divine Name becomes fruitful by the grace of the spiritual teacher as of God. 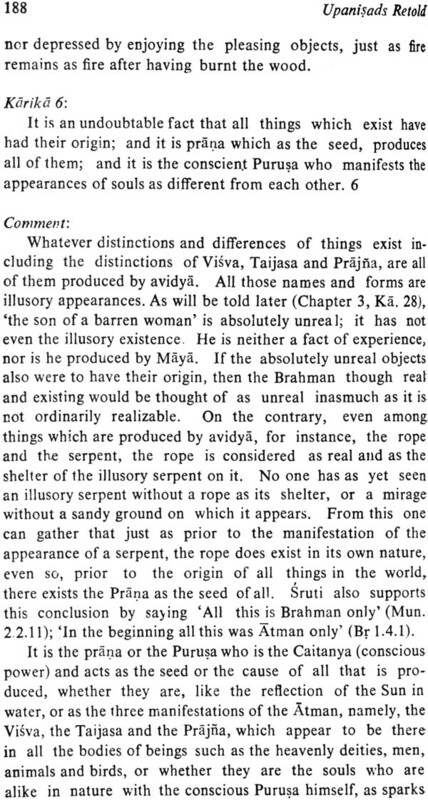 And the mystic comes to realize the Atman as Brahman, the earlier notions of an empirical 'I' and 'Thou' as well as of the 'Nature' outside appear to him as good as naught. Desires, doubts, fear, and infatuation vanish of themselves. 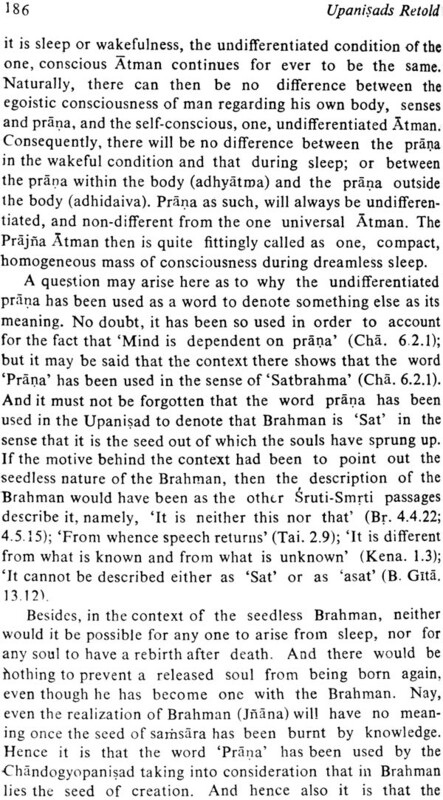 In other words, when the 'I' in 'I am the Brahman', the 'thou' in 'That thou art', and the 'all' in 'All this is Brahman' vanish o themselves in the unique, blissful, and constant experience of the Atman as being identical with the Brahman, there would remain no trace of the consciousness of the tiny individuality of a separate ego, no limitation of space and time, and no fear of any disease, old age, or death. A life of immortality and limitless Ananda even while one is living will be the divine reward for one who leads a morally good life and a life of spiritual meditation and contemplation on the divine Name and Form, respectively as instructed by the spiritual teacher. 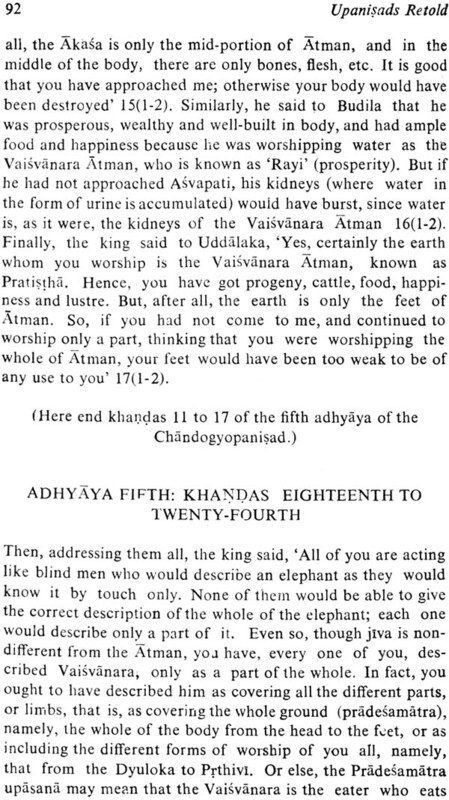 This is the eternal message of all the Upanisads; and this is the justification of retelling that message.